Made using fresh, ripe tomatoes, methi seeds, garlic and essentially even tamarind, Andhra Style Tomato Garlic Pickle pops us your palate with awesomeness. Heat vegetable oil in a karahi / pan. Add the tomatoes and cover and cook for 20-25 minutes until tomatoes become mushy. Heat sesame oil in another karahi / pan. Once the oil is hot, add mustard seeds, fenugreek seeds, garlic, curry leaves and dry red chillies. Fry for a minute until garlic turns slightly brown. Pour the tempering over the tomatoes. Add Kashmiri red chilli powder and salt and mix well. Keep mashing the tomatoes with the back of a ladle. Add tamarind and jaggery and cook for another 10 minutes. Transfer it in a clean glass jar. 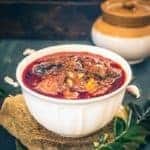 Enjoy cooking Andhra Style Tomato Garlic Pickle from WhiskAffair. Try more authentic tried & tested recipes from https://www.whiskaffair.com.